Kitenge can be draped as shirts, coats, skirts, dresses as well as headscarves. The colorful fabric is usually produced in Tanzania and is sourced out to other parts of the World. With the increasing trends, styles, and designs, the fabric is now being draped in ways to stay up to date with the fashion world. Denim was placed out of the office for the longest, but they are now getting more and more acceptance as time is progressing. Women are no longer required to dress up in button-down blouses. Dresses, skirts, and jumpsuits are now accepted as office-wear. Make pencil skirts, blazers, and wide-legged pants your wardrobe essentials. Do not hesitate with graphic prints or bold colors but make sure to not go overboard with them. Wear what you find is comfortable, no one can sit through a 9-5 job in outfits that make one uneasy. Make sure to follow all dress-code rules specified by your office. While showing skin may not be appropriate for most offices, we love how stylishly these Kitenge pants have been worn. With bright pants like these, it is preferable to wear them with solid colors. The white offers a nice balance and the look has been kept neutral by adding in a white coat as well. Overall, the look seems very comfortable yet chic. The turtleneck is a fine way to stay warm and in style at the workplace. 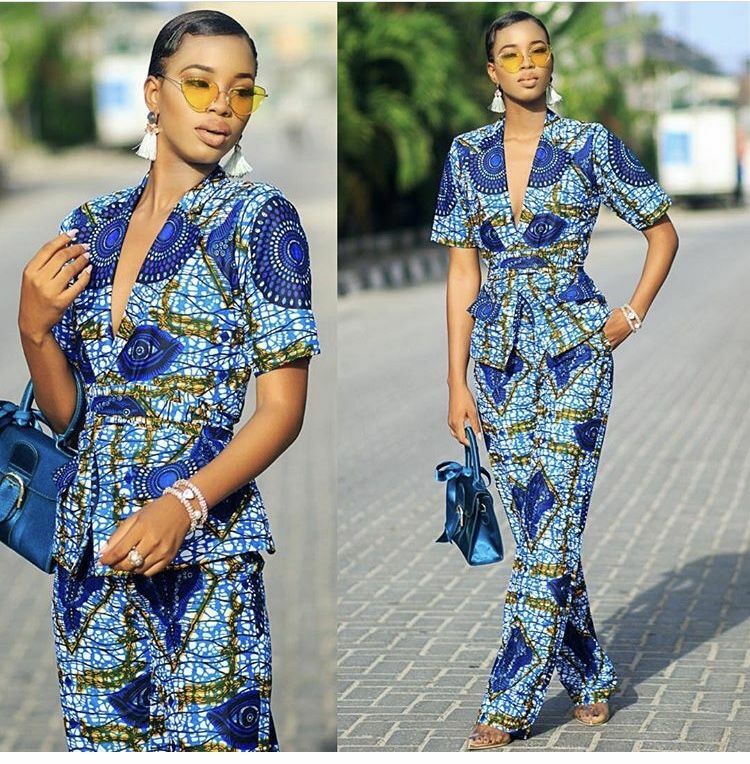 Here are Modern Kitenge Dresses & Designs For 2018. With progressing time and fashion trends, offices have become more tolerant of their uniform rules. This trendy top has the right cuts and designs and perfectly compliments the denim jeans. This kitenge top has a beautiful print to it and can be worn in multiple ways. The peplum style and sleeve detailing are both quite appealing. Since denim are now accepted as officewear, this top can be worn for a comfortable day at work. One of our favorite Kitenge looks has to be this one. The jumpsuit offers coverings in all the right places and suits her slender figure really well. For individuals that are often required to attend formal business meetings, they can easily style this one by putting on a blazer over it. With a colorful kitenge print like this, white seems like a good option for the blazer. It can also be worn as protection from the cold weather during the breezy Winters. This fusion between African and Asian fashion is an interesting one. The kimono is a traditional Japanese garment and was recently popularized all over the World. It was spotted on the Cannes Film Festival Red Carpet and was also done by Louis Vuitton recently. A kimono style dress in a kitenge print is a fun combination. This orange kitenge dress can easily be styled in two ways with neutral colors like White and Black. It can be accessorized with black shades, belts, and stilettoes. Kitenge prints usually involve patterns, lines and tribal art. Floral prints have also been done and are great to wear in Spring. This blue dress is flattering in all the right places and incorporates the big 2018 trend of ruffles. The dress is the right length and can be worn to offices. The pink bag is the kind of accessory you would want to add to a dress like this one. Here is another formal look featuring a low neck kitenge top with matching lowers giving more of a jumpsuit look. This shade of blue has a very professional tone to it and can be worn by women of all ages. The glasses remind us of Meryl Streep in Devil Wears Prada and gets a nod from us. 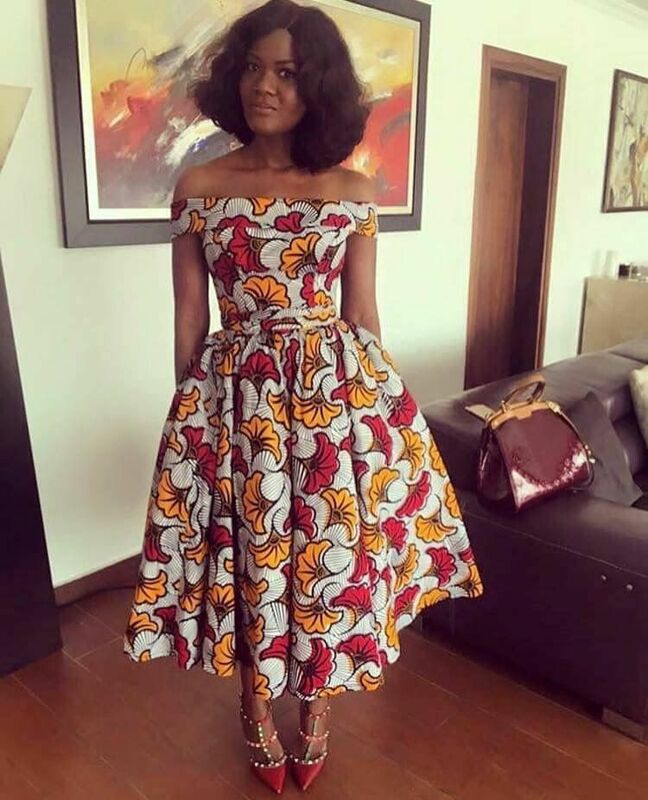 Here are 20 Best Kitenge Designs for Long Dresses. African women are known for their fashion sense as they wear the most vibrant prints and colors. Additionally, the African Turban Wrap is quite famous across the globe. 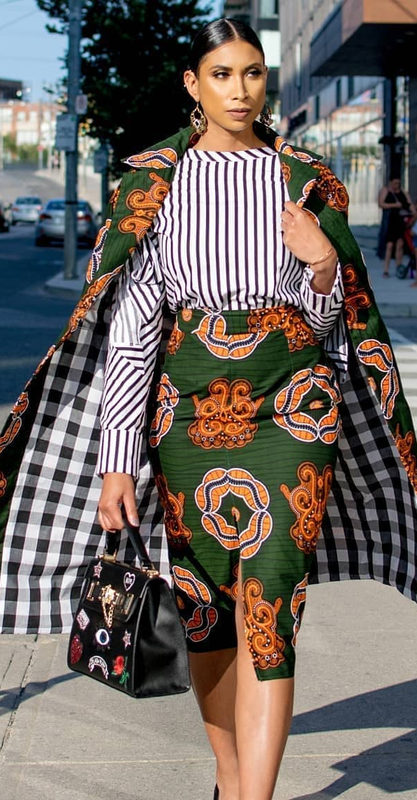 Here is some inspiration for working women looking for ways to style their turban wraps to match their outfits. This kitenge print is beautiful in its own way but what is winning here is the matching head wrap. The neatness of the entire look makes it even more attractive. We would not mind going to our workplace looking like that. Palazzo Pants are trousers that are wide legged and add a bit of flare. They are popular Summers Wear essentials but can also be worn in the Winters. They are quite easy to style and can be put together with a formal blouse for a business look. This tribal print Palazzo Pant has been put together with a plain black shirt for a minimal and comfortable look. 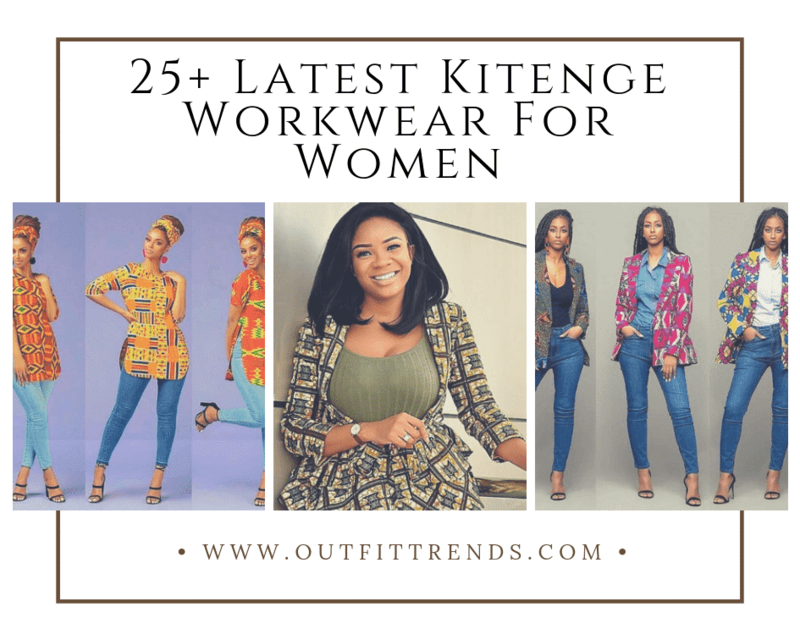 Keep your workplace style comfortable yet trendy with these kitenge pants. This interesting design is what is now being called the shirt dress which acts as a shirt from the front and a dress from the back. This style is a unique one and has been paired with a basic pair of denim jeans. The plaid kitenge dress has a gorgeous flare to it and is perfect for both Spring and Summer Weather. With the flow it has, it is best to keep the outfit minimal by going low on accessories. Working in the office in the scorching summer heat is the worst nightmare and can be countered best by wearing cool colors. There is no better welcome than white for the warm weather. These high waisted white pants and blouse are styled to perfection with a kitenge coat. The bright mustard coat with accents of red and black perfectly compliment the otherwise neutral look. The wide legged pant and coat make for a very professional-looking outfit and can be styled with bright colored bags and stilettoes. Maxi Skirts are highly voluminous and can be worn any time of the day. The floor-length skirt gives the look of a long dress. They can be paired with tucked in button down blouses. This Kitenge Skirt is just what you need for a casual Friday at the office. Not only are the skirts comfortable but also very funky. The look can be accessorized with some hipster jewelry. This Kitenge Long Dress is a personal favorite for the flawless look it gives. The choice of colors, print, and length is perfect. The high collar neck leaves the impression of a choker necklace. The dress is perfect for business meetings, formal events, as well as, a casual day at work. The dress is one of a kind and does not require too much accessorizing. It is perfect for both casual and formal occasions. This colorful blazer combined with a plain black dress is just what you need for your next business meeting. If your workplace is all about buttoned-up outfits, this makes a great choice for you. However, instead of sticking to the same old black and gray colors, how about adding in some brightness to your otherwise dull look. 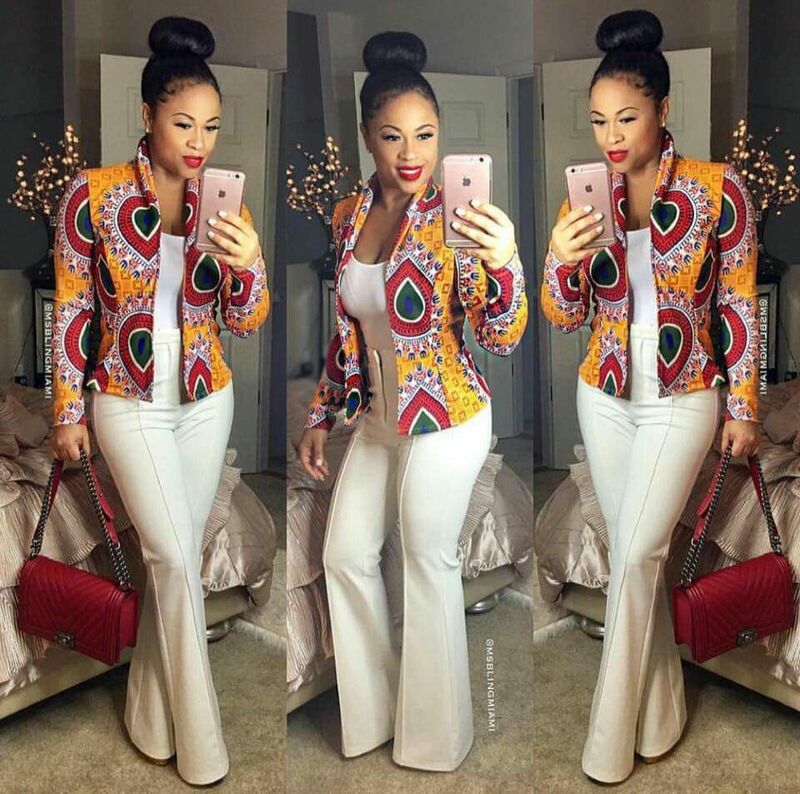 It is a great idea to invest in a kitenge blazer for the numerous ways it can be styled. This outfit makes it to the top of our list. The Kitenge Coat and the matching skirt is a hot favorite. It has been styled to perfection with the striped, wide-necked blouse. The Blouse and Skirt can also be worn separately for a mix-and-match kind of a look. The vibrant Kitenge color has been neutralized with the monochrome top and black bag. We also love how the coat has been left hanging over the shoulders like a cape. This multi-colored Kitenge Skirt in a Nigerian Design is another great option for everyday office wear. The skirt has been worn with a white top to neutralize the look. The blue bag is just what the look needed. When it comes to officewear essentials, pencil skirts definitely make it to the list, if not the top. With a very feminine look to it, the skirt is a modern yet traditional piece of clothing. This flamboyant kitenge skirt has been paired with a neutrally toned shirt and heels to keep it low. Do have a look at these Kitenge Dresses for Weddings. One of 2018’s biggest trend was the ruffles and frills that were done on shirts, dresses as well as pants. Stay up to date with this trend by incorporating it into your kitenge dresses. Since the ruffles are kept very minimal, they can easily be worn to the workplace. The matching heels are just what the kitenge dress needed for a little uplift. This figure hugging dress is apt for Spring Season for the fresh look that it carries. The combination of white and green is a great one. The look can be modified a bit by adding on a trench coat or some fine pieces of jewels. Danglers would work just fine with a wide neckline like that. Additionally, a white or black handbag would be a great addition to the overall look. Here is some more workplace inspiration featuring Kitenge. The African piece of clothing has been styled into a gorgeous floral print dress with off-the-shoulder sleeves. The dress is an ideal Spring and Summer outfit and is a must-have. This bright colored kitenge crop top is nicely styled with a bright yellow skirt. The torso is concealed with a high waisted skirt when worn with a crop top. The mid-length skirt is perfect for workplaces and compliments the funky top well. The yellow accessories are superbly matched with the skirt and we would not mind wearing them to our workplaces. This Egyptian style dress is one of the latest kitenge dress designs. The front slits and frills are an interesting take on the basic kitenge print. The dress can be worn with long coats or blazers for a more formal look. A purple handbag and matching coat shoes would be great additions to the office look. We love how elegantly this long kitenge coat has been styled with a little black dress. The dress has a professional vibe to it and can definitely be worn to business places. The beautiful color and butterfly prints are nicely complimenting the black dress. The long coat can also be worn over denim pants for a laid-back style if your office is accepting of it. We find high waist skirts to be underrated and want them to be the ‘it’ trend of 2019. The skirts help conceal the lower portion, making one look thinner. Wearing them high also helps one look taller. With added benefits like these, we find the skirts an essential for every wardrobe. These kitenge skirts have gorgeous prints that can be worn with neutral colors and can be styled with funky accessories. If you believe in ‘dress to impress’, this is the outfit for you. This officewear outfit has to be our hot favorite. The purple shirt has perfectly been styled with a kitenge pencil skirt. These skirts are one of the officewear staples that every working woman must have. The tucked in effect creates a very professional look. The handbag and heels are the right kind of accessories to carry with an outfit like this. Corporate offices are somewhat rigid in their uniform rules and accept formal officewear outfits only. This outfit here is a perfect choice for offices like those.